The Heights is a small hip town smack dab in the middle of the fourth largest city in the United States (Houston, Texas). On any given day, we can walk out the front door of The Bunny Bungalow and find adventure. One Saturday, Tall Husband and I were walking down 19th Street, the main drag of the historic downtown Heights, when we heard familiar music. "Oh my god! That's the Ink Spots," we said. I had sung my babies to sleep with the Ink Spots' old songs . Well the truth is that they begged me not to sing and promised to go to sleep if I would stop. Sadly, I sing like I dance, however, Tall Husband says that my singing is worse than my dancing. The music was coming from the Venus Hair Salon. We spotted the poster in their window that announced, "Huey Long of the Ink Spots, Appearing here every Saturday." Sure enough there he was with a CD filling the shop with an Ink Spot classic. I told him about hearing him and his group play in Germany back in the '60's and Tall Husband told him that I know all their songs. Then Huey invited me to sing one, so I sang, "I'm Gonna Sit Right Down and Write Myself a Letter." I don't mean to brag but that was the best I've ever sung. Even Tall Husband said I almost sang in key. 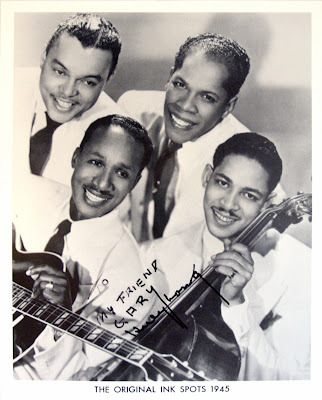 If you're too young to remember the Ink Spots (hell, I'm too young), find their recordings and listen to their smooth melodies. Remember when songs had a melody? Now I tell people I meet, "You know, I have sung with the Ink Spots," an exaggeration but one should never let the truth stand in the way of a good story. P.S. Huey Long is 104 years old this year and is the last living original Ink Spot.